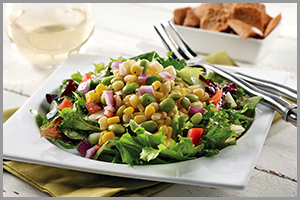 On a baking sheet, add sweet corn and edamame, place in oven for 10–12 minutes or until corn starts to brown. Remove from oven, cool. In a large mixing bowl, add edamame, corn, red onion, tomatoes, cucumber and garlic, mix well. Add vinaigrette as desired to corn mixture, toss to mix. Set aside. In a small mixing bowl, add garlic, oregano, shallot, basil, red wine vinegar, salt and pepper. With a hand-held mixer-immersion blender, puree all ingredients. Slowly drizzle in oil while mixing to emulsify dressing. Set aside. In a large bowl, add lettuce, toss to mix. Add additional dressing, toss to mix. Evenly divide on plates. Top with edamame corn relish evenly divided among plates. Serve immediately. April 24–30: Gretchen Sassenrath, a research agronomist for Kansas State University, discusses a study that shows a mustard cover crop can improve soil health.